Question: What is 127.0.0.1 IP address? 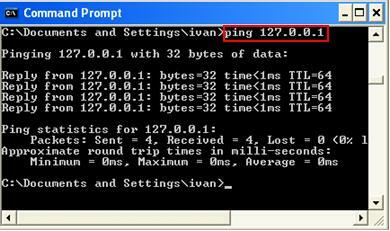 127.0.0.1 is standard IP address assigned to your network card once you have installed network card driver correctly. A quick way to test whether new network card works with correct driver installed, you can test to ping 127.0.0.1 in command prompt (you can test this even your computer is not connected to network). If you fail to ping this IP address, most likely network card driver is not installed correctly, network card is faulty or there is problem on operating system’s TCP/IP function. Why the above test works even it’s not connected to network? The reason is this IP address is also called loopback IP address or localhost, this IP address represents your computer's IP address itself from your computer’s viewpoint. This means that if you try to connect to 127.0.0.1, you are immediately looped back to your own computer. This IP address is also commonly used to access/test network program on computer itself. As an example, you have set up web server on your computer, after that you can issue http://127.0.0.1 in web browser’s address bar to access your computer’s web server. Note: The Internet Engineering Task Force (IETF) reserved the 127.0.0.0/8 address block for loopback purposes, so please don't assign this IP address range to network card.